The lane level is the basic level of the system. It´s made up by the lane controllers and all the necessary devices for toll collection and control and signalling of passage of vehicles. These devices also categorize them generating relevant information and storing and transmitting it to the station level. A toll lane is a functional unit that reports to the station level and is independent of the rest of the lanes. the toll fee -paid according to the passing vehicle characteristics- is performed through it . There is only one lane controller for all lane types. for avi lanes, the lane controller includes a second inductive loop detector (for entrance loop) an antenna interface card and a 48vdc power supply. 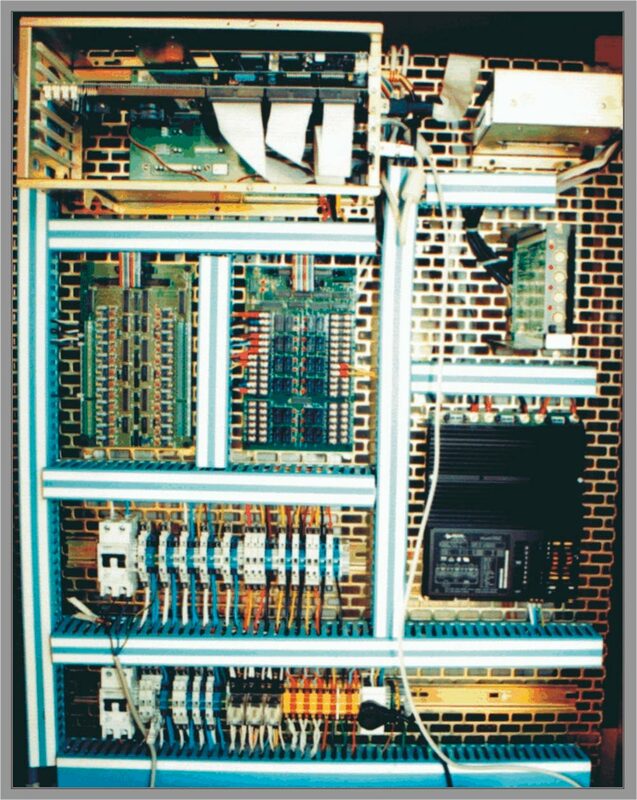 It is the unit made up by the CPU, electronic devices, in/out plates, hard disk, diskette unit, power supply, connector mounting, fuses, thermomagnetic switches, everything mounted on a mounting plate. This unit is installed in a closed cabinet with a wide door to facilitate the access to the maintenance staff. 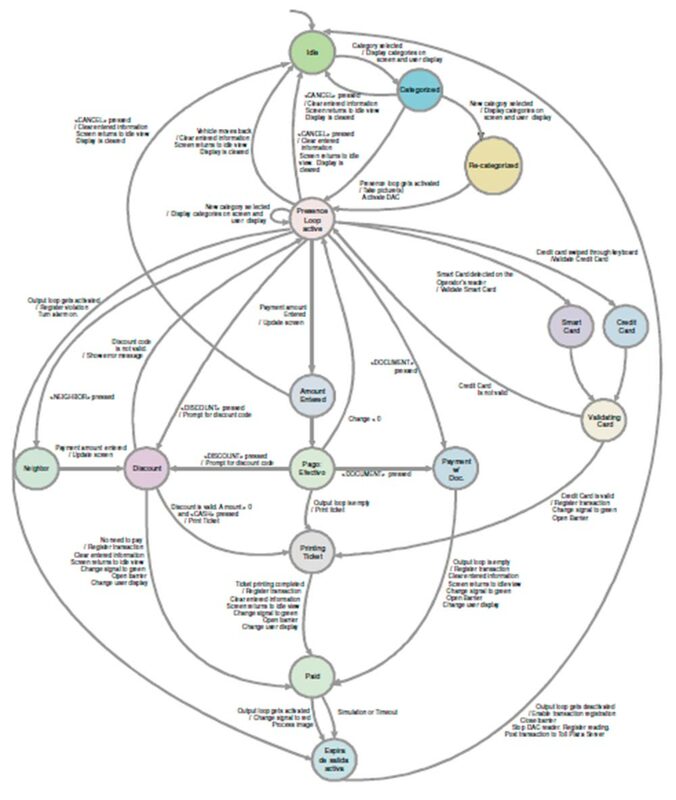 graphic presentation of all the events. The toll booth operator keyboard is the element through which the lane controller receives the necessary data to perform its functions properly. It desactivates the alarm and is used in emergency cases or for vehicles that have not made the corresponding payment. It allows to modify the marquee traffic light state. It assumes this payment mode. will have to go through a manual lane and give his details to the operator. The fiscal printer is the unit in charge of issuing a receipt (a ticket ) in accordance to the DGI 4104/96 General Resolution. For this, the equipment to be used is appropriately accredited hrough the General Resolution of the Federal Administration of Public Income of the Argentine Republic. This is placed nder the booth operator ‘s desk and consists of a push – button switch (single pulser) In case of an emergency, the booth operator presses the button with his knee producing a message on the screen of the Toll plaza Supervisor. It is a device that is placed on the lateral of the collecting booth and contains all the elements that allow the collecting management with magnetic strips and the interaction with the user. LCD user’s display , of alphanumeric information of two lines and 20 characters. This display is placed in front of the blister so that it can be seen by the vehicle driver. All the interface with the user will be done through it. The messages displayed will be of help of the “Category 2″, type such as, insert Strip”, “insufficient balance”, “Have a good trip”, etc. Each AVI Lane is equipped with an antenna (installed on the marquee) and an interface plate (integrated to the Lane Controller). The Tags’ reading / recording antenna allows the reading and updating of the members associated to the AVI collecting system. The Entrance Automatic Barrier is placed on the isle before the Collector Booth and is driven to indicate that the lane is open or closed. It coincides with the green or red light of the Marquee Traffic light. It covers the lane width so that it doesn´t allow the passage through it when it is closed. The room left is such that it won’t allow the motorcycles out either. 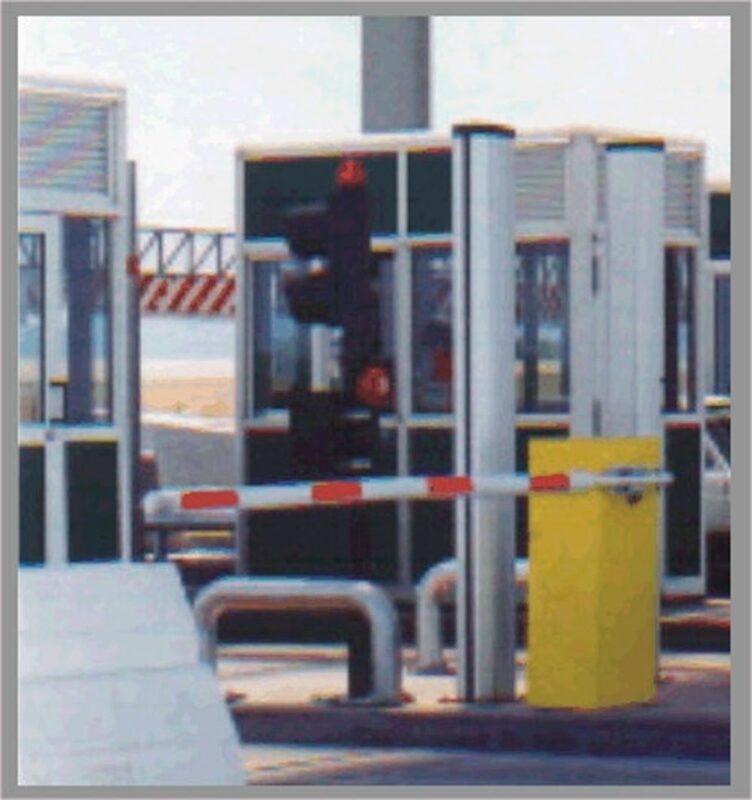 The Exit Automatic Barrier is placed on the collector booth isle and is driven at the moment the transaction is validated. It covers the lane width so that it doesn´t allow the passage through it when it is closed. The room left is such that it won’t allow the motorcycles out either. 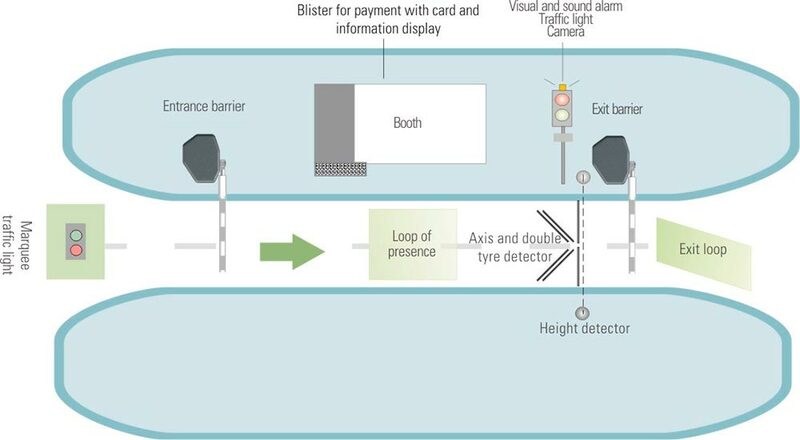 When the vehicle leaves, the magnetic loop detects it and the system produces the barrier closing automatically. The Traffic light is placed on the collecting booth isle and indicates the vehicle driver the moment when he is bound to continue the journey. 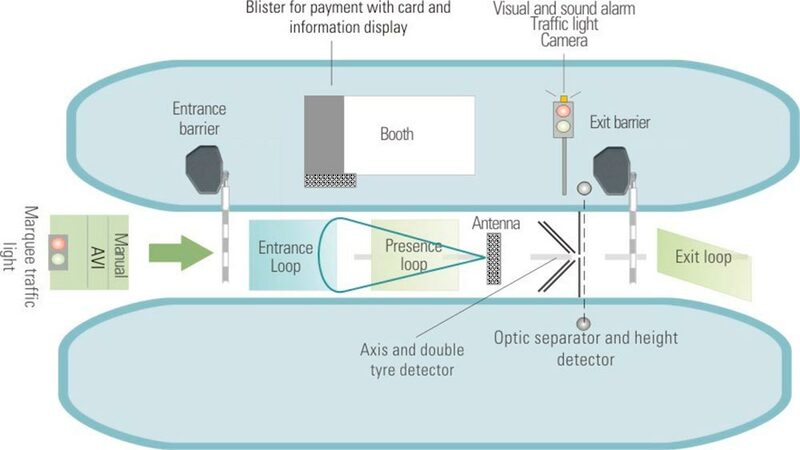 Once the transaction is validated, the green light is activated to give way to the red light automatically once the inductive loop detects the exit of the vehicle. The traffic light has a sound alarm incorporated that indicates the supervisors and toll booth operators that a violation is taking place in that lane. The Marquee Traffic light is placed at the height of the marquee profile and attached to it by means of the corresponding marquee notice . It tells the driver if the lane is qualified for the collecting task. 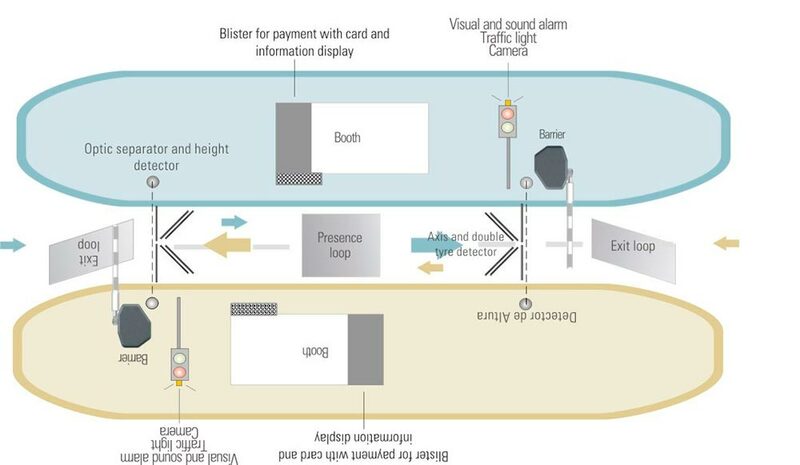 The lane opening is signaled through a green light flash and the lane closing through a red one, both working together with the entrance barrier and commanded by the lane controller. 2”, “Puentes del litoral”, “Have a good Trip”, “Thank you very much”, etc. Each lane is equipped with a camera situated on the traffic light post. 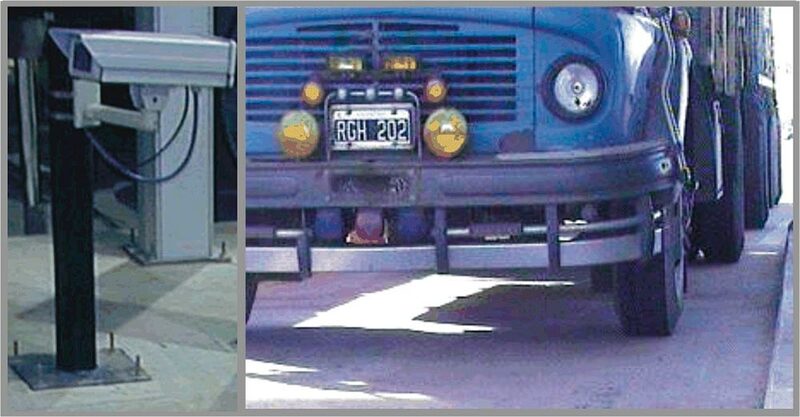 It allows to take the photograph of vehicles in specific situations. 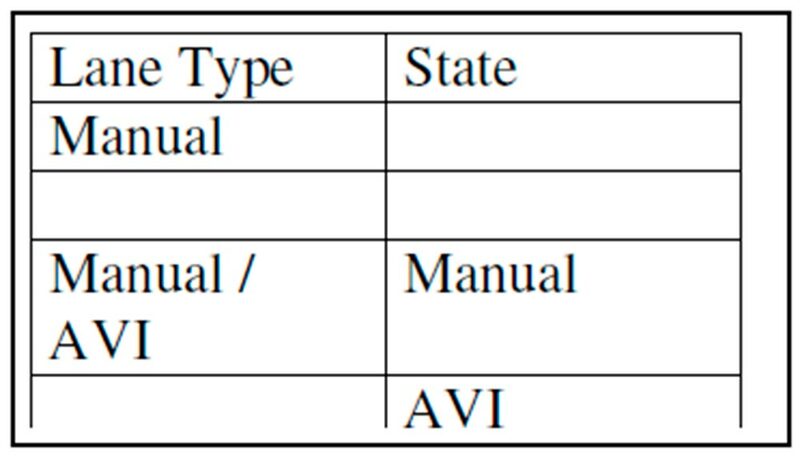 Every mixed lane (Manual / AVI) is equipped with a marquee variable notice . The vehicle separator is the unit in charge of detecting the discontinuity produced by the passing of two consecutive vehicles going at a high speed. It will be placed in all Manual/AVI lanes. 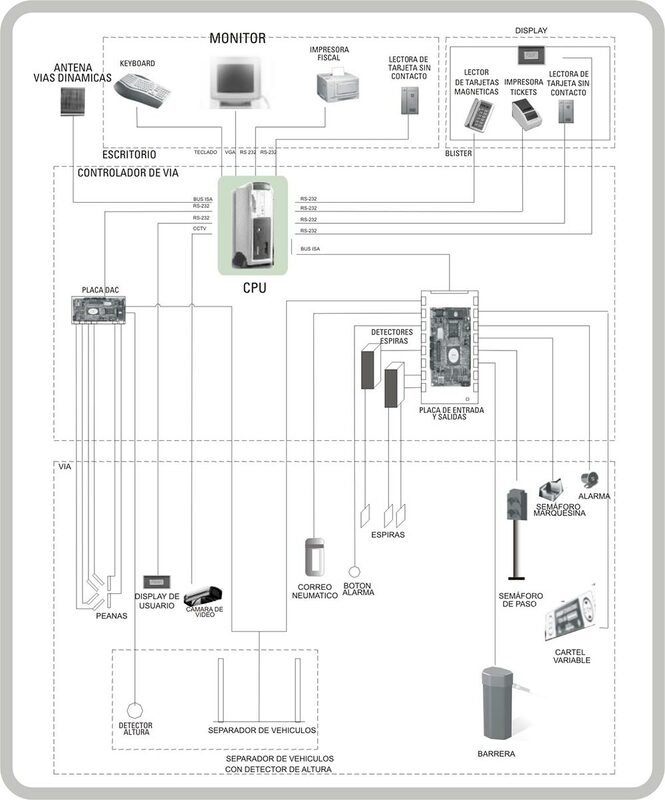 Its function consists of allowing a reliable passing logic avoiding ghostly violations or inopportune AVI management. El mismo se encuentra incorporado al separador de vehículos, antes mencionado y forma parte del sistema de DAC. The height detector is the unit able to emit an electric signal at the moment a passing vehicle has a height superior to 2,20 meters. 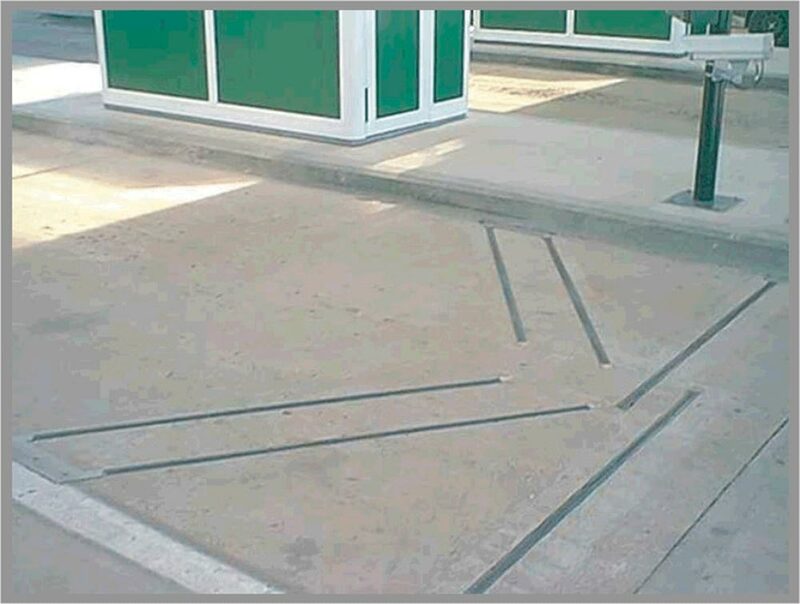 The magnetic inductive loops (inductive coils) are made up by wire loops with copper inductive coils: they are placed on the ground and connected to the metallic mass detector, essential to detect the presence of vehicles. When a vehicle stands on it a variation in the inductance value is produced; once this happens, it brings about the driving of one of its exits. The software runs under Windows NT and works with menus that present interactive screens with friendly graphic interfaces. The software as well as the hardware need Y2K Compatibility for an integral functioning. Registering all the anomalies, discrepancies, flaws, violations, transits and shifts that take place in the lane. – Configuring the hardware elements the lane has. – Allowing the connection of remote users to diagnose the lane from other locations. The closed state appears when the lane controller is on, its application is working but the shift is not open. In this state, the lane is waiting for either local commands or commands from the server. At the same time, it will register all the incidents that can be detected. All the vehicles that go through the lane in this state will be entered as closed lane violation and stored in the system with time, date, lane number and category. These messages will be associated to the station shift in the system, since in the closed lane state there will not be any open shift where to register these messages. In this state, the lane is apt to receive messages; so, the screen zone for messages will display the last messages with their corresponding time and date. It will take place with the ignition of the equipment. It includes all the ignition processes until the indicator of “Closed lane” appears on the screen zone intended for that. 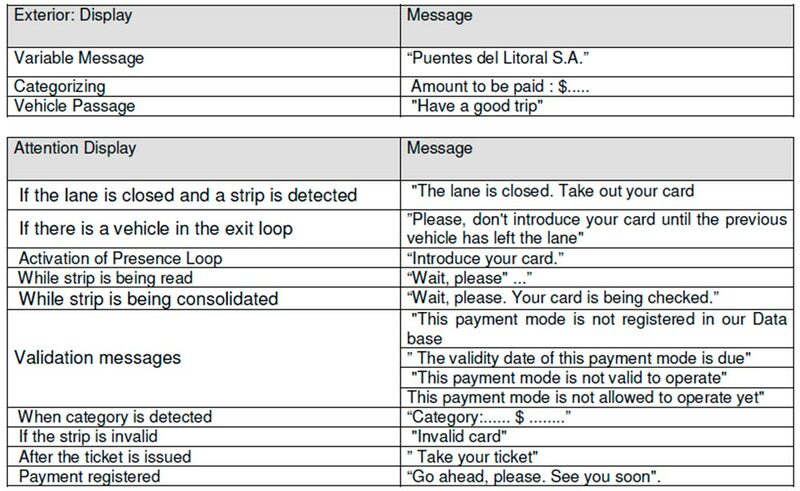 During this transaction the lane does not detect any type of event (command or signal). During this transaction, the lane controller verifies the system integrity and the functioning possibilities. In case of being on-line it will show the users’ charts, the tariffs, the senders(issuers) and any other chart managed on line. It will take place by means of an event of closing lane or shift, either locally or remotely. To be able to close the lane, the must not be any vehicle there. 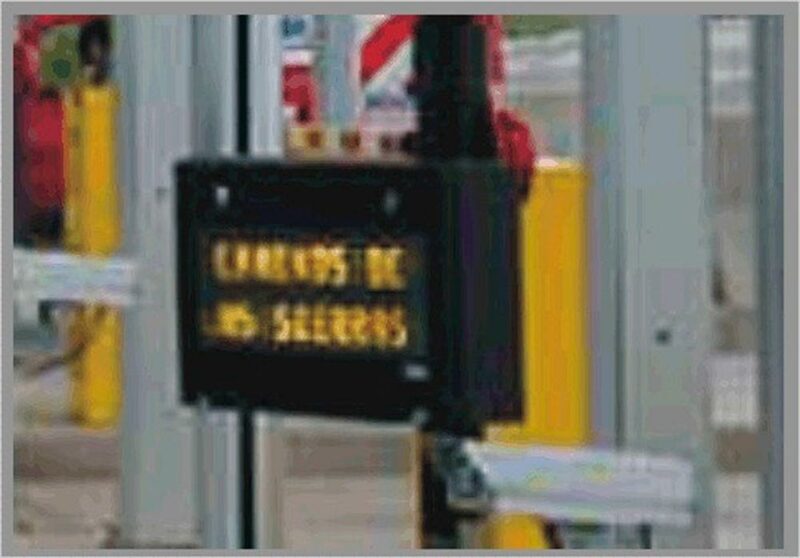 On the contrary, when intending to close the lane, the corresponding information will appear on the screen. Lane Closing: The next time the operator opens the lane a different sub-shift, within the same shift, will be generated. Automatic: When they work without any human intervention, using a motorized strip reader Manual: When the booth operator is the one that controls the lane. AVI: When they work without any human intervention, accepting AVI as a payment mode. It will be performed through local login or opening telecontrol. – Keyboard: The booth operator presses the login button and then types his dossier (or record) number and password. – Remote : When the opening is performed by the station chieffrom the control spot. In this operation he will have to introduce the number of the booth operator´s dossier (or record) which will remainregistered. OFF-LINE: There isn´t any connection at that moment. In case the lane is off-line, the system will locally validate the dossier (or record) number and the password, with the last users’ chart in force. Once the controller has received the order to open (whatever the origin), the opening process is similar for all the cases. Based on the versions chart, it asks the server the versions charts that it doesn’t have. It uses its internal counter of ticket number. – It verifies its correct operation and in case of any flaw in a certain device it will register the incident with the mistake and will remain in closed lane state. – It goes on to the corresponding state whether the dossier (or record) number belongs to a booth operator or to a maintenance worker, and according to the opening mode registered. – The fiscal printer automatically assigns the Ticket number. In case of there not being any communication with the station, the lane assigns a shift according to its counters and indicates this condition in all the messages generated in off-line mode. The lane does not work with sub-shift assignments for which it will generate new shifts in all cases. This type of test is executed from the closed lane state, and allows to test the lane elements from the lane controller. This item is very useful to start the system and when some important maintenance is done to it. The aim of this type of test is to give the possibility of managing the signal elements from the supervising computer seeing that what enters there reproduces what in fact occurs in the lane. In this way, it will be possible to modify the passage and marquee traffic lights, the display messages and watch- apart from all thisthe state of the DAC detectors. Besides, it will be possible to print test tickets, read magnetic strips and visualize their content and perform barrier openings and closings. It is possible to check the lane controller operation and see that its memory is free of flaws. (auto test) This modality can be only entered with duly authorized strips. The entrance / exit to this maintenance modality will be stored in the system within the events and auditory register, keeping the number of strip entered and the people involved in it, date/time and lane number. 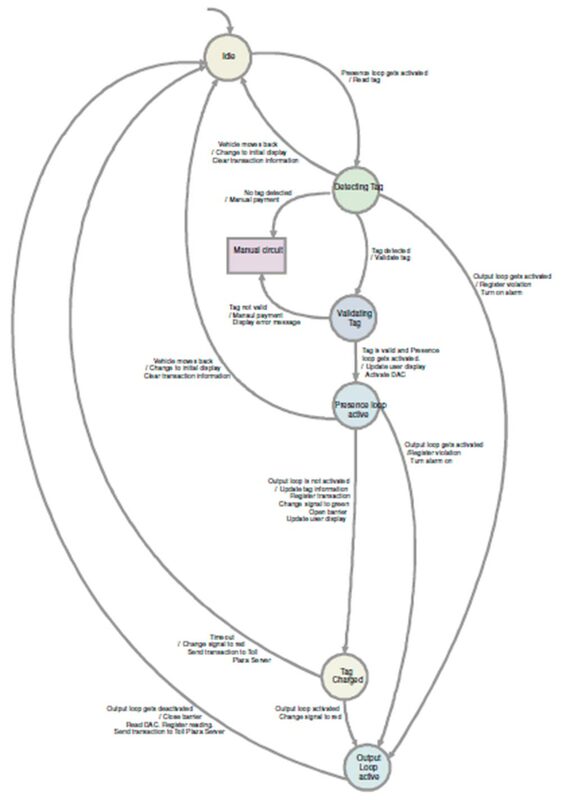 AVI Transactions with test tags. Off-line: In case of losing connection, the lane software works independently. It performs validations against the received parameters in the shift opening. As it is not possible to perform liquidations in this operation mode for lack of information, all the data is transferred once the connection is recovered. Only at that moment can the balance be closed. In this mode the lane files can be updated only from the Station, using a diskette with files of Tariffs, White lists, Black lists, Operators, etc. It is not possible to send diskette information from the lane to update the station data base. This operation will be performed automatically when the communication between both levels is restored. The Station Messenger Server automatically starts when the PC is switched on. It internally keeps the data of the lane development updated. It validates the user’s details (manually or through magnetic strip ) against the users chart. It assigns a shift number, checking that the last assigned shift to that user has been closed. On the contrary, it gives way to the shift in force. It transfers the updated data referred to tariffs, users and quotations to the lane PC . – It receives the vehicle ‘s information generated by the lane. It sends the reply to the lane. It records date, time, shift, lane, anomalies and incidents in the base. It is used when a pre-paid TAG user manages the recharge of it. The booth operator will have to select this key and enter the amount he wants to load as credit in the Tag. In certain cases, it interrupts the function that is being executed. Once the collecting key is pressed, the operation cannot be cancelled. The “cancel” operation can be performed in the Manual Type Lanes. means of a selection from a list. A CTV camera will be capturing everything that takes place in the lane. For each activated device, there will be an image capture that will be provisionally kept until the transit is completed. Once the transit is completed, and if there had been any anomaly, the image captured will be kept. This image will go together with the corresponding transit data and will be of great use in the validation process.